Located within a vibrant City Centre full of restaurants, bars and theatres, the Valentine is a double upper villa built in Victorian times, internally refurbished with all the comforts of modern accommodation including a delightful new breakfast room. 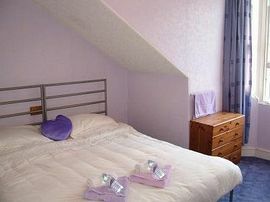 We are 1000m from Princes Street and on foot just 900m from the Castle and the famous Royal Mile. Bedrooms range from double/twin to 5 person rooms. All are attractively furnished with Digital TV channels and hospitality trays. Ironing facilities and hairdryers are also available. Free broadband internet access. 24 hour access with your own key. Free car park - essential in the city centre. To ensure our guests comfort, we are unable to accommodate pets or families with very young children. A much praised breakfast awaits you - We serve 100% fruit juices, Kelloggs cereals, unlimited tea, fine filter coffee, or hot chocolate, unlimited white or wholemeal toast, eggs to order (fried, poached, scrambled or boiled) and a full Scottish cooked breakfast cooked to order of your choice of sausage, bacon, haggis, black pudding, tomato, egg, mushrooms and baked beans. Whatever your reasons for visiting our beautiful city, we hope that you'll stay with us at the Valentine City Centre Guest House and experience the very best in Scottish hospitality from an Edinburgh family born less than a kilometre away!! Our local knowledge is guaranteed to assist you, we are brimming with useful information, tips and restaurant discounts that we have arranged. 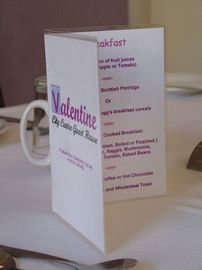 To top it all, the finest of full Scottish breakfasts is included every morning of your stay, entirely cooked to order. 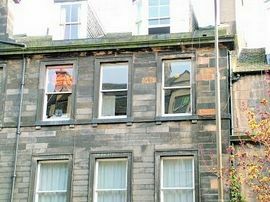 Closest Guest House to Edinburgh Castle within City Centre. Free Parking if booked in advance (no on-street free parking in Central edinburgh). Disabled Facilities: There are no disabled facilities. Victorian building with stair access only. Special Diets Provision: Special diets are catered for. We will assist with any requirements; vegetarian, lactose intolerant, gluten-free etc if advised in advance. Smoking Facilities: Smoking is not allowed. Outside only under Scottish Law for all accommodation. With luggage you may wish to make use of the local buses (single fare £1.00 - no change given) (Nos 10, 11, 15, 15A, 16, 17) or a taxi (£5.00 or less). Once free of your luggage you have the choice as the central area is all within comfortable walking distance of the Valentine. Despite, our central location, we can offer free parking in our own car park, this is limited however and must be reserved in advance. 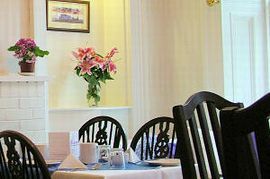 Take the A90 right into the city centre, then take Lothian Road (A702) for half a mile to Tollcross, at the very top of the hill take the right-hand fork into Leven Street, one block further turn right again into Gilmore Place at the King's Theatre, the Valentine City Centre Guesthouse is immediately on your left. Take the A8 all the way into the city centre then take the A702 as above. Take the city by-pass (A720) West to the Fairmilehead exit, then the A702 for 3 miles down to Morningside and back up to Bruntsfield, after the sharp right bend that the road takes in Bruntsfield, the road drops back down on a left curve, through several pedestrian crossing lights to a junction with the King's Theatre to your right. Turn left here into Gilmore Place, the Valentine City Centre Guesthouse is immediately on your left. From Edinburgh Airport you can catch a taxi to the City Centre, this will cost around £15.00 and is the easiest option. There are also Airlink buses which run directly into the city centre, the cost is £3.00 single/£5.00 return and the journey time is 25 minutes. From the stop at Shandwick Place, walk around the corner to Lothian Road and a bus (10,11,15, 15A, 16, 17) to King's Theatre stop - if it happens to be a No.10 stay on until it turns right here then get off at the bus stop immediately afterwards outside our door. An onward taxi is approximately £4.00, buses as described from St Andrews Square or Princes' Street are £1.00 per person - exact change (Note that a day pass valid on all normal services is £2.50). Low Season: £15.00 - £30.00 per person (with long stay discounts). High Season: £20.00 - £80.00 per person. Lowest prices are of course achieved by 3, 4 or 5 person groups. Unfortunately we are too popular to offer single night Friday or saturday night stays.